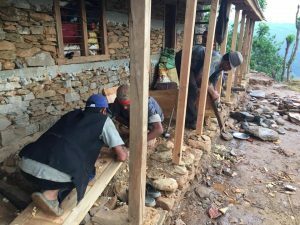 The Nepal research case study took place from the 18th of April until the 01st of May 2017 in several communities within Dhading District, which was devastated by the earthquakes of 2015. Building on the success of the roundtable carried out in Philippines, the PSB team organised a second roundtable based in Nepal, inviting local practitioners, academics, policymakers and affected communities to reflect on our initial findings and engage with local actors who were present in the immediate aftermath of these disasters as well as those still involved in the practice of reconstruction and recovery. It was important for us to critically reflect and engage with these important actors in how to take this research forward. Revising our initial observations and sharing them with experts in the practice and theory of shelter and disaster recovery was an important step to better understand the place of our research within the context of recovery processes in Nepal. By bringing such expertise together as well as the voices of some of the people who have practised (self-) recovery we hoped to (1) promote further understanding and interest in ‘self-recovery’ in Nepal; (2) promote collective engagement and discussion on safer self-recovery; (3) share some of our initial findings from fieldwork in Nepal and engage in knowledge exchange on how to move forward with this research; and finally (4) build a local network in Nepal of different actors involved in the recovery process to contribute to our growing community of practice. The day began with an introduction by Santosh Sharma to the work of CARE Nepal and its partners, followed by an introduction from Bill Flinn of the PSB team and an outline of the day. The day was split into presentations about the methodology and findings of the research and group activities that explored the meaning of recovery and (self-) recovery and implications for practice. Susanne Sargeant led the introductory activity by inviting everyone in the room to reflect on the meaning of recovery with others on their table. They were invited to put these reflections down on paper to then present to everyone else. Discussion themes and key messages about the meaning of recovery were written down as each table presented. The objective of this exercise was to warm up and begin thinking about the meaning and implications of recovery that could set the groundwork for a discussion in the following exercises. Bill Flinn presented the background of the project, how it had emerged and how it has developed until the present day. A key point that was highlighted is the emerging evidence that in humanitarian shelter practice only 20% or less of the need is met after most natural disasters. This means that the majority of the population affected by disasters are self-recovering. There is therefore a growing motivation to better understand recovery processes, adjust to the changing nature of aid and needs of affected communities as well as identify the inherent opportunities for appropriate and effective support to those self-recovering and those recovering with varying degrees of support. Holly Schofield proceeded to explain how working with different disciplines played out in the practice of using qualitative research. Originally, each partner (ODI, BGS, UCL and CARE UK) had developed a 2-page proposal and list of objectives. These were brought together and reviewed to identify common themes and develop a set of key research questions that could guide the research. Building on the discussion of the research questions, Holly Schofield explained the methods used to build a multidisciplinary methodology that was then applied in each of the communities visited. The PSB team split into two smaller research teams, Team A (Holly, Bill, Tom) and Team B (Luisa, Alejandra, Susanne) in order to reach a greater number of communities. One community was visited per day and a similar methodology was applied in all communities within reason. Although the methodology changed throughout the research process, frequent discussions between the two teams enabled these changes to happen in parallel and ensured that similar themes were being discussed each day. Each of the methods detailed in the following pages had its own objectives. Information was triangulated by comparing findings obtained from each method. An important element of this study is its multidisciplinary approach, which was then highlighted by a reflection, from the different disciplines, on the methods used throughout the fieldwork. Alejandra Albuerne built on Tom’s discussion by reflecting on how engineering as a discipline can be integrated into many different aspects of recovery and in doing so be used to ask the right questions to understand the process. Bill Flinn discussed the methodology, reflecting on how it differed from normal humanitarian practice of considering ‘sectors’ (WASH, livelihoods, health etc) and valued being able to step away from having to count and measure against quantitative indicators. Bill also highlighted that as it was multidisciplinary rather than multi-sector, he was able to understand things from engineering, hazard science, social sciences and practice in a more holistic way. Luisa Miranda Morel invited participants to reflect on the meaning of (self-) recovery through discussion and building a mind-map. 1. No support – households build back using their own resources, no additional training, no funding. Each group was assigned a scenario and were invited to discuss the meaning of (self-) recovery within the context of their scenario. Within that discussion groups were asked to consider the themes of livelihoods, shelter and WASH, hazards and environment and finally well-being. Overall the exercise produced some interesting discussions on the different elements of the recovery response in Nepal. It was particularly interesting to use scenarios to ensure that practitioners pushed themselves to think outside of the ‘practitioner box’, thinking about what might be happening without them being involved in the response. It was also interesting to observe how as support increased in the different scenarios, the role of affected communities became less and less evident in the discussion. What has to change in humanitarian practice to support self-recovery? And how? What lessons for self–recovery can be learned, in terms of sector integration, from the Nepal experience? a) Local knowledge, vernacular and culture used in humanitarian response? b) Geoscience, social science and engineering used in humanitarian response? How do we get a) and b) to work together to enhance practice? How can a self-recovery approach enhance the opportunity for longer-term developmental impacts and resilience? What does successful self-recovery look like? How do we apply Monitoring, Evaluation, Accountability and Learning? The conclusion of the workshop was carried out with a final Q&A session accompanied by the handing out of a feedback form where participants were able to share their views on how this space could be improved. 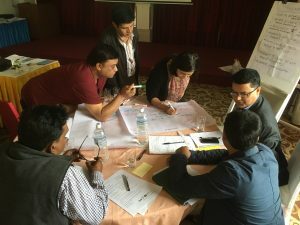 The outcomes of these workshops are currently informing the development of a working paper that will cover the key findings from the research team and from each discipline and present initial reflections on the implications for practice of a humanitarian approach that aims to support self-recovery. Stay tuned for more! ← End of Pilot Project Conference on the 13th of July!